Be the first to share your favorite memory, photo or story of Jacquelyn . This memorial page is dedicated for family, friends and future generations to celebrate the life of their loved one. Jacquelyn Sue Miller, 89, of Greenwood, Missouri, formerly of Largo, Florida, was born, March 31, 1929, in Newark, Ohio. She departed Thursday, January 10, 2019, at the Saint Luke’s Hospital in Kansas City, Missouri. Jacquelyn was a homemaker. 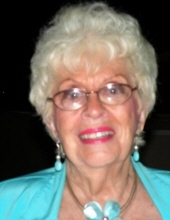 She was also a longtime member of The Rock Community Church in St. Petersburg Florida. Jacquelyn was preceded in death by her parents Glenn and Dorothy (Faller) Kidwell. She is survived by 2 sons, Reverend Glenn G. (and Rita Louise) Miller of Weeki Wachee, Florida, and William S. (and Susan) Miller of Newark, Ohio; 5 grandchildren, Tracie (and Scott) Jordan of Greenwood, Missouri, William R. Miller of Olathe, Kansas, Gregory G. (and Mari Beth) Miller of Stella, North Carolina, Nicole (and Tony) DeVito of Heath, Ohio, and Nicholas (and Brittany) Miller of Newark, Ohio; 15 great grandchildren; 4 great-great grandchildren; other relatives and friends. Memorial contributions may be made to The Rock Community Church 4224 28th St. N. St. Petersburg, Florida 33714. A celebration of life gathering will be held March 30th, 2019 in Greenwood, MO. To plant a tree in memory of Jacquelyn S. (Kidwell) Miller, please visit our Tribute Store. "Email Address" would like to share the life celebration of Jacquelyn S. (Kidwell) Miller. Click on the "link" to go to share a favorite memory or leave a condolence message for the family.